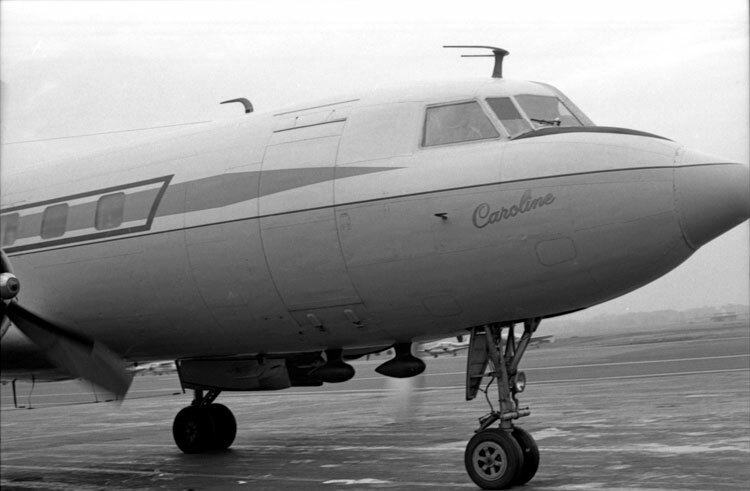 Named after the two-year-old daughter of soon to be President John F. Kennedy, the Caroline began its service as the Kennedy family airplane in 1959. 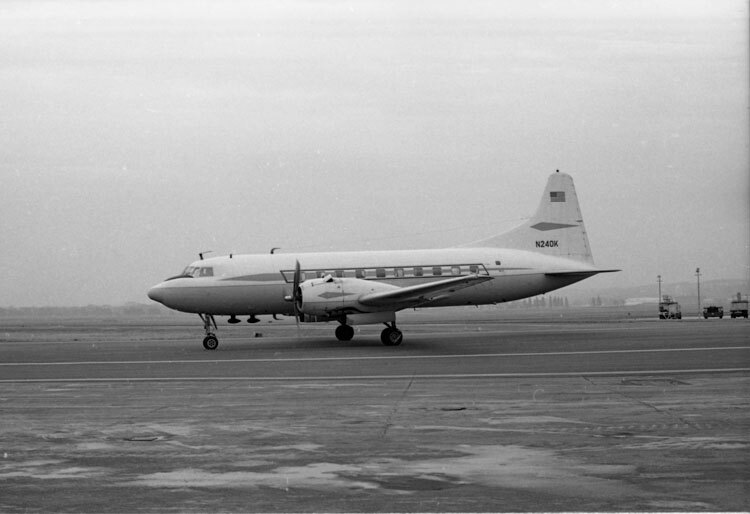 The twin engine Convair CV-240 was one of the first planes with cabin pressurization that was manufactured for commercial use after World War II and also holds the honor of being the first private aircraft used during a United States presidential campaign, dramatically changing the future of political campaigning. Caroline served the Kennedy family for nine years and 650,000 miles, ending her run at Washington National Airport where she was donated to the Smithsonian Institution on November 17, 1967. 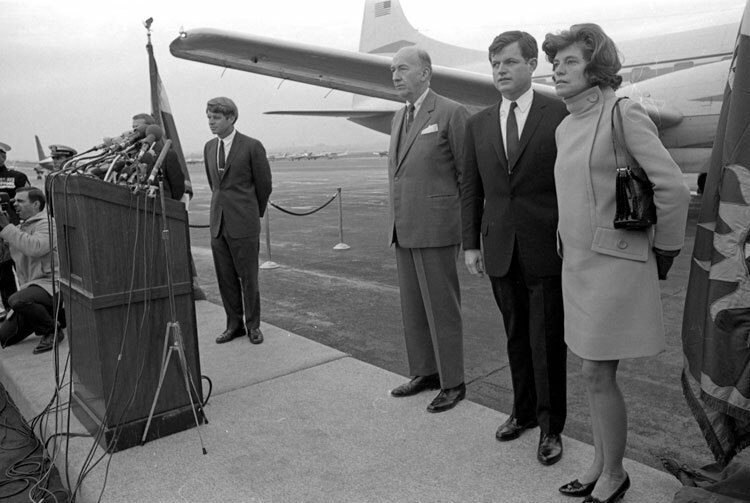 Senator Robert F. Kennedy presented the plane to Smithsonian Secretary S. Dillon Ripley and was accompanied by brother Edward M. Kennedy and other members of the Kennedy clan. The Caroline is currently in storage at the National Air and Space Museum’s Paul E. Garber Preservation, Restoration, and Storage Facility. Click through the slideshow below to see images from the presentation of the Caroline to the Smithsonian. 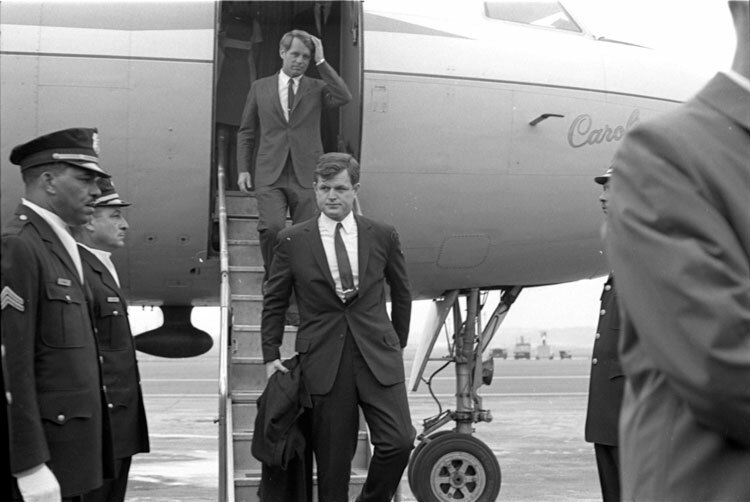 Senators Robert F. Kennedy and Edward M. Kennedy exit the aircraft "Caroline" at Washington National Airport, November 17, 1967, by Unidentified photographer, Black and white negative, Smithsonian Institution Archives, Acc. No. 11-008, Image Number: OPA-1124-15A. 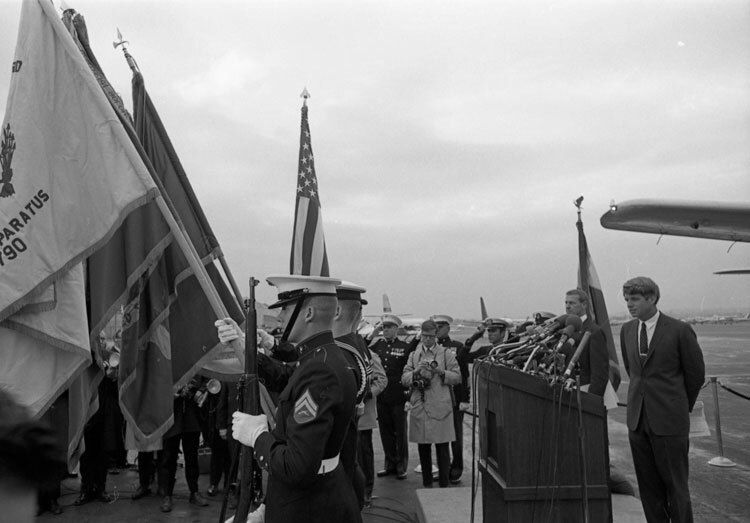 Presentation of Kennedy aircraft "Caroline" to the Smithsonian at Washington National Airport, November 17, 1967, by Unidentified photographer, Black and white negative, Smithsonian Institution Archives, Acc. No. 11-008, Image Number: OPA-1124-12A. 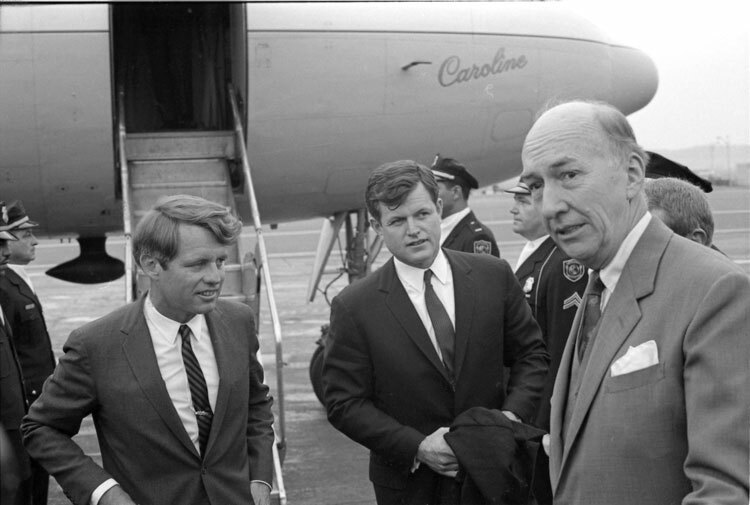 Senators Robert F. Kennedy and Edward M. Kennedy with Smithsonian Secretary S. Dillon Ripley in front of the aircraft "Caroline" at Washington National Airport, November 17, 1967, by Unidentified photographer, Black and white negative, Smithsonian Institution Archives, Acc. No. 11-008, Image Number: OPA-1125-6A. 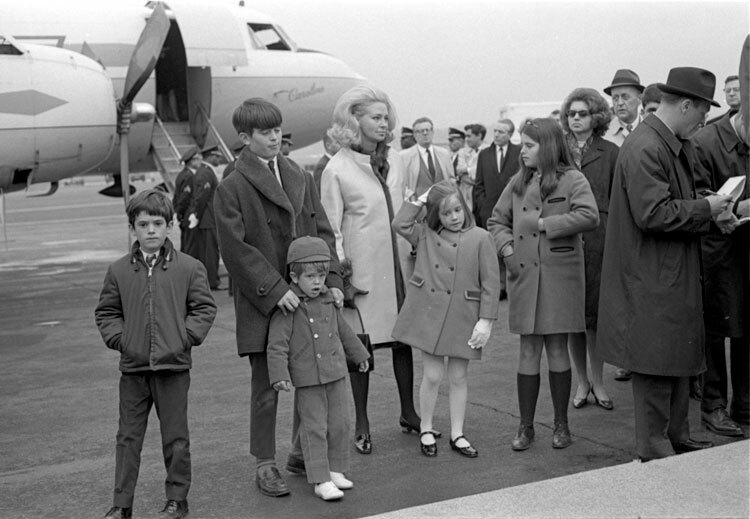 Kennedy family children and Joan Bennett Kennedy, wife of Senator Edward M. Kennedy, in front of the aircraft "Caroline" at Washington National Airport, November 17, 1967, by Unidentified photographer, Black and white negative, Smithsonian Institution Archives, Acc. No. 11-008, Image Number: OPA-1124-22A. Senators Robert F. Kennedy and Edward M. Kennedy with Smithsonian Secretary S. Dillon Ripley at the presentation ceremony of the Kennedy family aircraft "Caroline" to the Smithsonian, November 17, 1967, by Unidentified photographer, Black and white negative, Smithsonian Institution Archives, Acc. No. 11-008, Image Number: OPA-1125-8A. 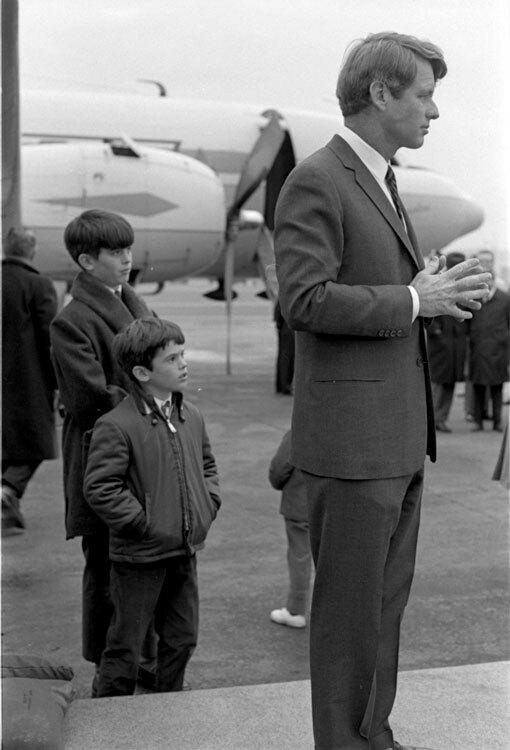 Senator Robert F. Kennedy at the presentation ceremony of the Kennedy family aircraft "Caroline" to the Smithsonian, November 17, 1967, by Unidentified photographer, Black and white negative, Smithsonian Institution Archives, Acc. No. 11-008, Image Number: OPA-1125-10A. Senator Robert F. Kennedy speaks at the podium during the presentation ceremony of the Kennedy family aircraft "Caroline" to the Smithsonian, with Senator Edward M. Kennedy and Smithsonian Secretary S. Dillon Ripley, November 17, 1967, by Unidentified photographer, Black and white negative, Smithsonian Institution Archives, Acc. No. 11-008, Image Number: OPA-1125-11A. 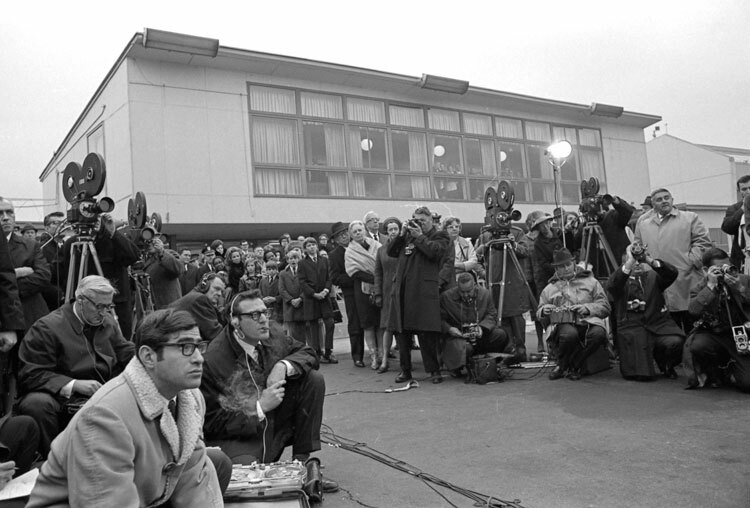 Press and spectators at the presentation ceremony of the Kennedy family aircraft "Caroline" to the Smithsonian at Washington National Airport, November 17, 1967, by Unidentified photographer, Black and white negative, Smithsonian Institution Archives, Acc. No. 11-008, Image Number: OPA-1125-14A. 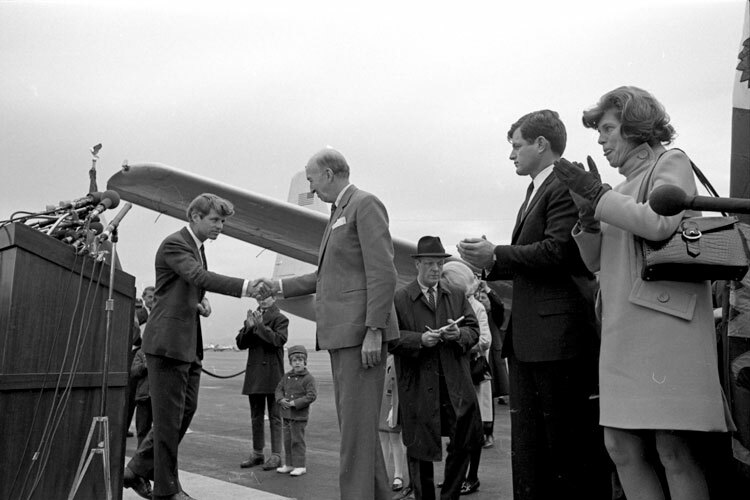 Senator Robert F. Kennedy and Smithsonian Secretary S. Dillon Ripley shake hands at the presentation ceremony of the Kennedy family aircraft "Caroline" to the Smithsonian, with Senator Edward M. Kennedy, November 17, 1967, by Unidentified photographer, Black and white negative, Smithsonian Institution Archives, Acc. No. 11-008, Image Number: OPA-1125-15A. 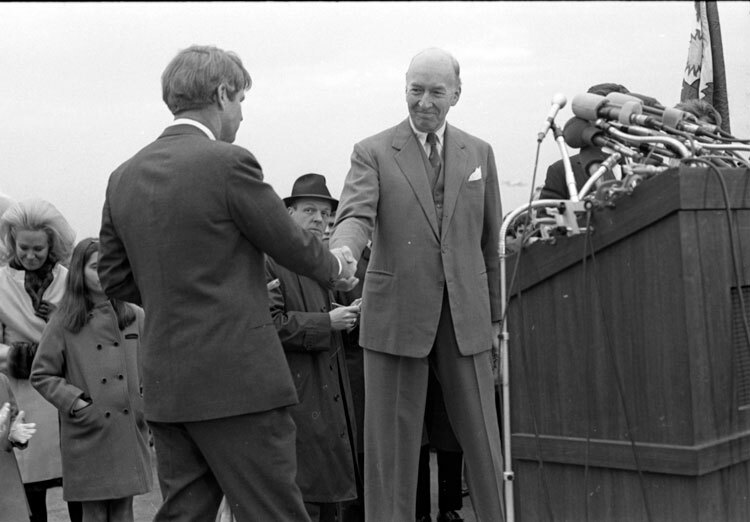 Senator Robert F. Kennedy and Smithsonian Secretary S. Dillon Ripley shake hands at the presentation ceremony of the Kennedy family aircraft "Caroline" to the Smithsonian, November 17, 1967, by Unidentified photographer, Black and white negative, Smithsonian Institution Archives, Acc. No. 11-008, Image Number: OPA-1124-26A. Senator Robert F. Kennedy at the presentation ceremony of the Kennedy family aircraft "Caroline" to the Smithsonian, November 17, 1967, by Unidentified photographer, Black and white negative, Smithsonian Institution Archives, Acc. No. 11-008, Image Number: OPA-1124-28A. 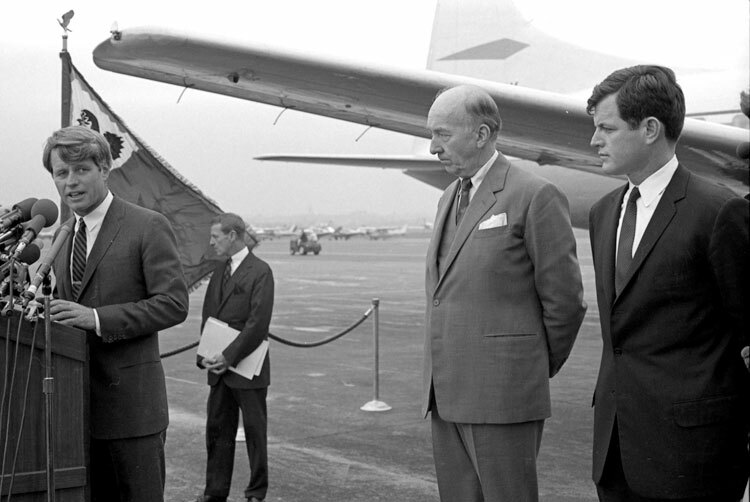 Smithsonian Secretary S. Dillon Ripley speaks at the podium during the presentation ceremony of the Kennedy family aircraft "Caroline" to the Smithsonian, with Senators Robert F. Kennedy and Edward M. Kennedy, November 17, 1967, by Unidentified photographer, Black and white negative, Smithsonian Institution Archives, Acc. No. 11-008, Image Number: OPA-1125-17A. 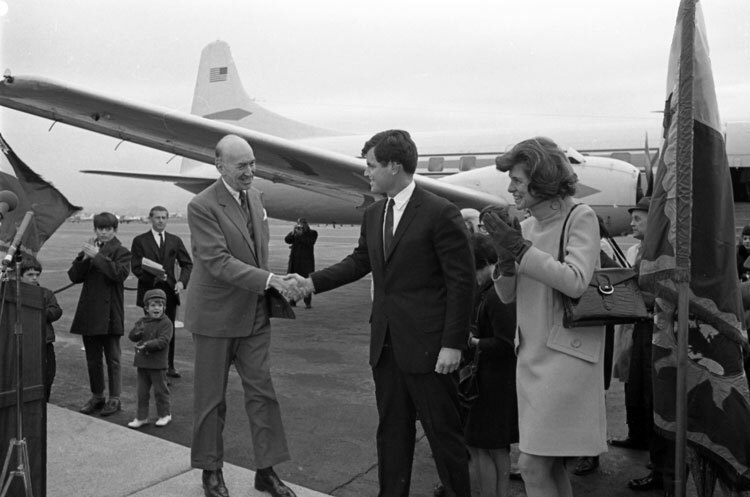 Smithsonian Secretary S. Dillon Ripley and Senator Edward M. Kennedy shake hands at the presentation ceremony of the Kennedy family aircraft "Caroline" to the Smithsonian, November 17, 1967, by Unidentified photographer, Black and white negative, Smithsonian Institution Archives, Acc. No. 11-008, Image Number: OPA-1125-19A. 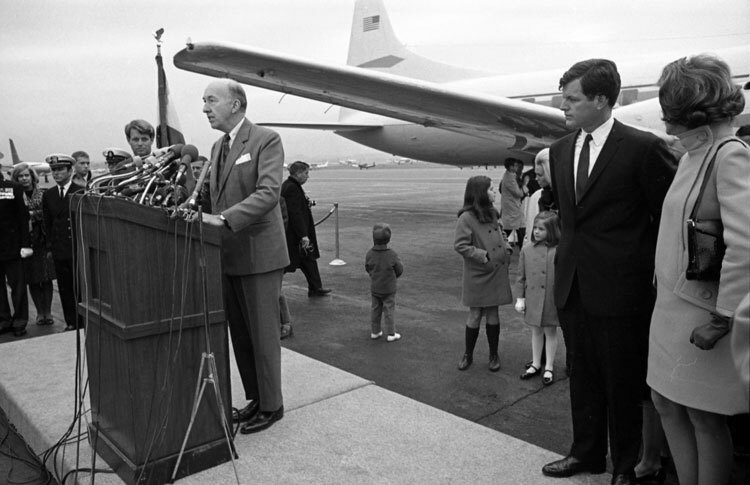 Presentation of Kennedy aircraft "Caroline" to the Smithsonian at Washington National Airport, November 17, 1967, by Unidentified photographer, Black and white negative, Smithsonian Institution Archives, Acc. No. 11-008, Image Number: OPA-1125-1A. 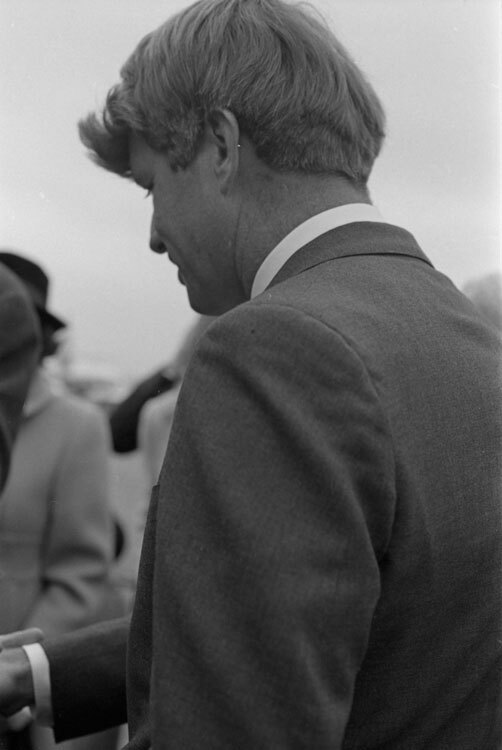 Senator Robert F. Kennedy at the presentation ceremony of the Kennedy family aircraft "Caroline" to the Smithsonian, November 17, 1967, by Unidentified photographer, Black and white negative, Smithsonian Institution Archives, Acc. No. 11-008, Image Number: OPA-1124-36A.